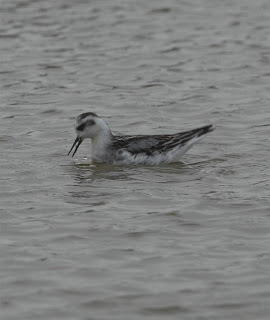 Highs and Lows of Birding: The 'elusive' Grey Phalarope that almost got away! 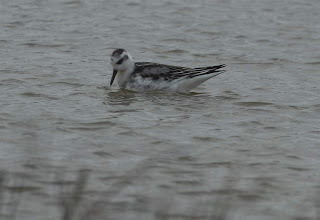 The 'elusive' Grey Phalarope that almost got away! 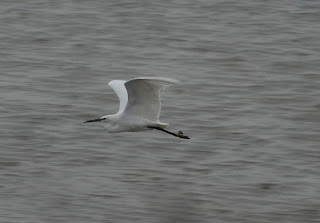 The Little Egret is a familiar sight in Kent today especially in North Kent where extremely large roost can be seen in late summer to early autumn. It's incredible to think that as recently as the early 1980's Little Egret was a 'mega' in Kent and many other parts of the UK. Now they are expected. They breed in Kent and rarely a weekend passes when I don't encounter them somewhere or other on the North Kent marshes. Another week of work and news of a Grey Phalarope that was 'showy' and tame on Elmley RSPB was high on the agenda this weekend. James Hunter at the wheel together with John Tilbrook (JT) and myself headed off towards Elmley RSPB on the Isle of Sheppey arriving at 0815. Parking was a struggle with not knowing which space to choose in the empty car park!! This is a typical feature of some sites in Kent, great for birding but not always many people around. We slowly made our way down to the Swale hide, seeing 4 Short-eared Owls as they flew from their chosen roosting area near to the river wall. The ditches were diligently checked but only a white plastic bag and a Moorhen were found. Looking out from the Swale hide, 68 Great crested Grebe, 10+ Little Egret, Curlews and a few Marsh Harriers. On the marshes behind the hide, ie looking towards the prison we located 3 Merlin, a Peregrine and 10+ Marsh Harrier but still no Grey Phal!!! 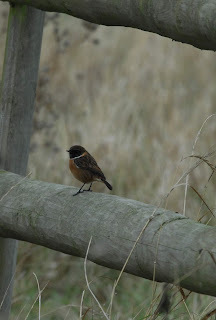 A Stonechat sitting quietly on the gate near the disable parking area was some compensation and good views of Frank and Tom Cackett ready for their go at dipping Grey Phal! Just as we were getting back to Kingshill Farm Frank phoned to say that they had found the Phalarope. We started to return to the Swale Hide when Frank phoned 'again' to say it had flown off again. undeterred we walked to the site and fortunately gained permission to view the bird away from the main track. What a corker! It was difficult at times to photograph the bird as a result of it's constant spinning but with the finger on the shutter trigger I got a few. This was the first Grey Phal I'd seen in Kent for a couple of years and well worth the effort. 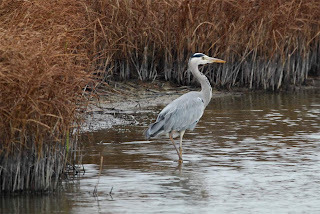 With the Grey Phal under the belt we set off back to try our luck at a few other sites, via a close Grey Heron. Next port of call was Warden Bay for the hoped for Velvet Scoters. Despite the cold, conditions were ideal, a flat sea, little wind and a thermos of tea. Common Scoter numbered 25 and eventually 2 distant Velvets were picked out on the deck and then in flight. A convenient viewpoint overlooking Chetney marshes was next, with Short-eared Owl, Sparrowhawk, a few more Marsh Harriers seen. Further along the road at Funton, Pintail numbered several hundred with a distant female Red-breasted Merganser and 5+ Little Grebe for variety. With constant scanning the Brent Goose flock was eventually loacted though nothing unusual amongst the 200+ birds, so onto Lower Halstow. With the tide gradually coming in, two Med Gulls were located, an adult winter and a first winter, plus a Kingfisher, Hen Harrier, and the usual wintering Whimbrel called a few times. In the deep water channel, 9 Goldeneye were found though no rare Grebes or Mergs. Another scan of the Brent Geese revealed a Black Brant with the Dark bellied Brents, easily picked out by it's flashy white flanks and blacker plumage together with it's 'cobweb' on the neck meeting at the front. There has been a bird wintering in the estuary here for several years now.